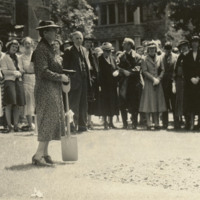 Later photo of Marion Edwards Park holding a shovel and standing in front of a small crowd. Inscribed on back: "Groundbreaking for new wing of Thomas. Gift of Mary Hardenbergh 1943." 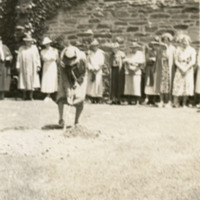 Later photo of Marion Edwards Park digging with a shovel in front of a small crowd. Inscribed on back: "Groundbreaking for New wing of Thomas. Gift of Mary Hardenbergh 1943." 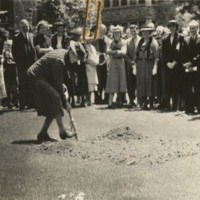 Later photo of Marion Edwards Park holding a shovel. A small crowd watches her. 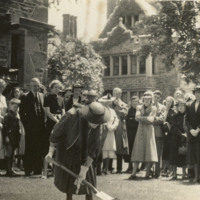 Inscribed on back "On groundbreaking of "New" (West) Library Wing of Thomas." 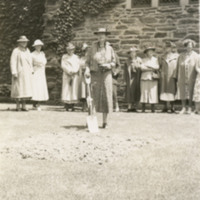 Later photo of Marion Edwards Park standing behind a woman and holding a shovel. A small crowd watches her. 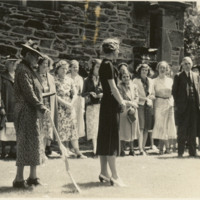 Inscribed on back: "on groundbreaking of "New" Thomas Library West Wing."